Aluminum and stainless steel reusable water bottles are long-lasting and can keep your water cold for hours. They are also an eco-friendly option. Studies have shown that less than 15% of plastic water bottles are actually recycled, so they are a huge contributor to the Earth’s landfills. By choosing a reusable bottle, you can help reduce our carbon footprint and reduce the amount of toxic plastic found in landfills. Aluminum or stainless steel water bottles are reusable beverage holders that can house your hot or cold drinks. They offer the perfect alternative to harmful disposable plastic bottles. Most people prefer stainless steel bottles to aluminum bottles, but we have included both in the list below so that you can find the right one for your personal preferences. The durable Sigg Traveller Water Bottle is constructed of BPA and Phthalate-free materials and will not leach toxins into your drink. It is also solvent-free and uses heavy metal-free paints on the outside. The 1-liter aluminum water bottle has a screw top, is virtually unbreakable, and has a taste-neutral plastic liner that is resistant to acids and odors. The functional bottle can keep your water cold and is the perfect travel companion. This popular bottle is available in a range of colors and designs to best suit your needs and preferences. It is the common choice among the outdoorsy types because it can really take a beating and is designed to last for years. It is also recommended by Good Housekeeping and Wired. The bestselling Zojirushi Stainless Steel Mug features vacuum insulation technology to keep your beverages hot or cold for about six hours. The sleek, leak-proof design features an extra wide mouth that easily accommodates ice cubes. The 16-oz water bottle features a convenient tight fitting push-button lid, so you can easily open it with one hand, as well as a safety lock for your protection. The durable SlickSteel finish is corrosion resistant and repels stains. It also traps heat on the inside, so you won’t have to worry about hot beverages burning your hands. The slim design easily fits in cup holders and the bottle can be completely taken apart for a thorough cleaning. This bottle is available in two sizes and various colors to match your style. It is recommended by Good Housekeeping, Consumer Search, Cook’s Illustrated, LifeHacker, Tested, The Wirecutter, and The Sweethome. It also has exceptional reviews online, including more than 3,200 five-star reviews on Amazon. The thermal vacuum insulation is also backed by a five-year warranty for your added peace of mind. The durable Klean Kanteen Classic 27-oz Stainless Steel Bottle features a convenient loop cap, which allows you to easily clip the bottle onto your bag. The BPA-free water bottle has no phthalates, lead, or other toxins, and won’t leach harmful chemicals into your beverage or retain or impart flavors. It is leak-proof and features a wide mouth opening that allows for ice cubes and bottle brushes. It also features rounded corners, so no dirt or bacteria can hide away in hard angles. The slim design fits in most cup holders and bike cages. It is also dishwasher-safe for easy cleaning. The bottle is available in a range of sizes and colors to best suit your personal needs and preferences. It is backed by outstanding online reviews and a lifetime warranty for your added peace of mind. It is also recommended by Wired and The Wirecutter. This is easily found in most outdoor sports stores for a reason. It can really take a beating and is designed to last reliably for years. The Thermos Vacuum Insulated 18-oz Stainless Steel Hydration Bottle features vacuum insulation technology, which keeps drinks cold for 12 hours and can also maintain hot temperatures for hours. The leak-proof bottle can also help preserve flavor and freshness. It is BPA-free and has a durable, unbreakable stainless steel interior and exterior. It has a slip resistant silicone grip and is condensation-free, so it won’t leave any rings behind. The top can be screwed off so that you have plenty of space to include ice cubes. It features a convenient push-button lid, so you can easily open it with one hand. The free-flow spout has a hygienic cover and a locking ring for enhanced safety. It is well designed, leak-proof, has no metallic taste, and fits in most cup holders. Thermos has been the leading manufacturer of convenient insulated products for over 100 years, so you can count on it working well for you. It comes in four colors to match your style. It is recommended by Good Housekeeping and has exceptional reviews online, including more than 2,000 five-star reviews on Amazon. It is designed to last for years and is backed by a five-year limited warranty for your added peace of mind. The rugged Coleman 32-oz Aluminum Bottle is sturdy enough to take on your next vacation or hiking trip. Coleman is a leader in outdoor and camping supplies, so it’s no surprise that they also offer one of the best water bottles for all your outdoor (and indoor) needs. The lightweight bottle features a looped topper seal to protect against leaks and ensure you can easily hang it from your bag. The wide mouth opening can also fit most ice cubes. It is the perfect size for most cup holders in the car or on fitness equipment and is dishwasher safe for easy cleaning. Unfortunately, you cannot choose which color you’ll receive. The colors vary, so you can expect either red, black, blue, or silver. It is featured on Shape.com and has outstanding reviews online. 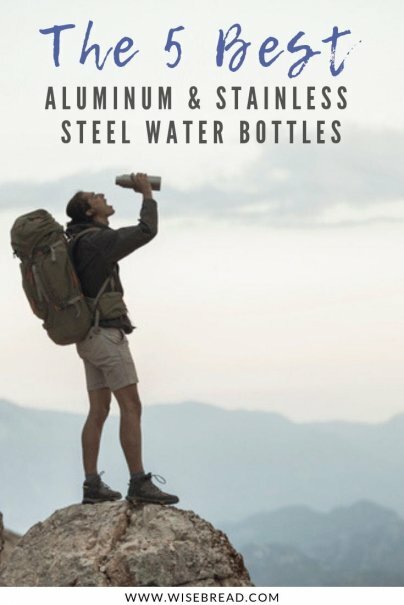 And those are our recommendations for the best aluminum and stainless steel water bottles. As always, be sure to check Wise Bread's Buying Calendar to learn when and how to buy just about anything!